Ramada Plaza Hotel also has their Buffet Ramadhan for this year. 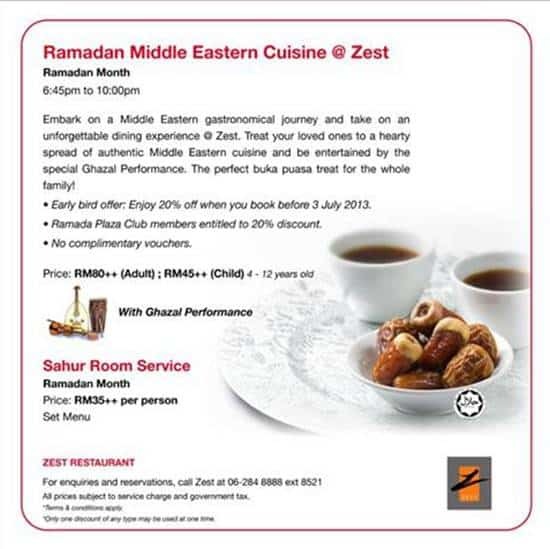 This year the promotional package feature a Middle Eastern delights at the Zest Restaurant. There are varieties of Arabic sweets, kicking off the appetite with refreshing Arabic and local salad namely cous cous salad, fried eggplant, potato salad, white cheese with thyme, fattouch, tabouleh, kerabu, jeruk and more. The main dishes include chicken shawerma, lamb ouzzi, falafel, samak harra, stuffed chicken with oriental rice and nuts, chicken and beef satay and more. The Middle Eastern delicacies such as chicken maqlooba, okra stew with lamb, harra fish and many more Arabic food are also available for you to choose. Not only Arabic food, local food are also being served such as beef rendang, ikan assam pedas and chicken kurma . The Ramasa Plaza Club members are entitled to a 20% discount throughout the holy month of Ramadhan. There is also a live traditional Ghazal performance that will entertain you while you enjoy your iftar. Not just for Ramadhan buffet, Ramada Hotel also including Sahur Room Service. Contact the hotel for details. If you have been looking for a buka puasa with a different, why not try Arabic?